Police established what apparently amounted to a public assembly dispersal unit in Parking Lot #4 Wednesday September 3rd from noon to 6 pm. Musicians, dancers, observers--all who've regularly gathered in this space for the last ten years were ordered to leave. I wasn't there but continued to get reports by phone, e-mail, and directly on the street about the police officers, who reportedly “moved along” all musicians who attempted to play there. They may also have physically occupied the space under the trees usually used by the drum circle and Food Not Bombs to preempt and sabotage the weekly event. The first I actually heard about the bizarre police decision was 4:30 PM Wednesday. I received a call from Donna Deiss. She reported that three officers, including Sgt. Michael Harms were standing in the middle of the lot, where drummers regularly play. They were directing all musicians and others to leave, saying there had 'been complaints'. Shortly thereafter, I got a call from Valerie Christy (who subsequently sent me this e-mail). She spoke with anger and frustration about the situation and did some videoing of the area to document the police occupation and dispersal of public assembly and the counterculture there. Valerie's e-mail: “Today the drum circle at the Farmers Market is not there. Nothing but an empty space,two cop cars,and three cops.They came up and told the group, that had just started to assemble, to leave today.And they dutifully left like good boys and girls in school on the playground. People came by asking the cops what happened. People were yelling political slogans at them,one witness said. She also said she was going to stand there and fight for her rights alone. She said,'I have a right to be here. ''Where's our community? ', one young woman said, as she pushed her child in a stroller past the now empty space where drummers drummed, people danced, Food Not Bombs fed the poor,and all was peaceful. Activists were alerted today.Will they come to the aid of the community? Will they come encourage us to fight for our rights?They did before. The Trash Orchestra came and played, the video cameras came ... and the drummers came back. “I'm sure you've heard already but those fuckers drove away the drummers from the Farmer's Market yesterday. They set up shop at 12:00 and drove away anyone who approached the tree area. When I got there at 5:30 there were still two cops standing against their patrol car. I asked them 'what happened, where is everyone?'. They stated that vendors have been complaining, and that there were people constatntly blocking the flow of incoming cars in the entrance way and creating public safety hazards. So they told people they had to go somewhere else. \There was was both an erie and sad silence walking around in the Farmer's Market yesterday. It sucked. It's still not clear to me what law(s) the SCPD were using or what they're likely to use next Wednesday if they again attempt to disrupt a public assembly (actually a misdemeanor crime—which I've been charged with, but never tried for). I haven't spoken yet to Sgt. Harms, who can be quite forthcoming, and who may have been the Senior officer there. The “Parking Lots and Garages Trespass Law” is the most likely law police will use next Wednesday, since it makes it illegal to (a) linger in a parking lot unless you are parking or retrieving a vehicle, and (b) then only for 15 minutes and while actually parking or retrieving that vehicle. Various resistance strategies are possible. These include: taking tickets and challenging them. Asking to be taken to a magistrate before agreeing to sign the ticket. Contacting the ticketing officer's sergeant and asking to speak to her/him first. Playing an instrument from the roof of a legally parked vehicle, leaving after 15 minutes and returning. Riding your bike in and out at 15 minute intervals. Walking off the property every 15 minutes and then returning—while declining to respond to officer comments about “do you have a car here?” etc. +++Ask “am I free to go?” and if not told you're under arrest, to simply walk away from the officer. +++Don't respond to questions other than with questions for the officer—such as “why are you ere?” “have you had a complaint?” “who made it?” Seek, but don't give information. +++You have no requirement to provide ID or identify yourself at all, if asked. If you're being arrested or cited, doing so shortens the process. The struggle against this ordinance—vigorously proposed by Mayor Coonerty--has been fought at City Council for two years (and lost). The struggle to take back one lot--Lot #4--for four hours on Wednesday afternoon--was won on the streets in January and February because people were willing to risk arrest and assemble in numbers for civil resistance. Now the police have suffered the setback of a likely defeat in the Deiss case where Sgt. Christian LeMoss broke the elderly disabled woman's arm, falsely charged her with resisting arrest, and apparently gotten the SCPD higher-up's to cover his criminal conduct. There are indications that the City is scrambling to present a financial settlement to Deiss to avoid embarrassing disclosures of LeMoss's excessive force and the SCPD's subsequent cover-up. Nonetheless the War on the Poor goes on. Last Saturday night Officer Winston reportedly kicked a homeless man in the face and body as he lay on the levy. The man feared this was direct retaliation for his previous criticism of Winston on FRSC. (http://www.radiolibre.org/brb/brb080824.mp3 , http://www.radiolibre.org/brb/brb080831.mp3 , and http://www.radiolibre.org/brb/brb080904.mp3 ). The Drum Circle struggle presumably can be won again--particularly with the massive opposition to the Cathcart/Cedar proposed parking garage expressed at the recent City Council candidate forum where only Coonerty didn't oppose it. If people actually organize and take the risks necessary. Doing something is certainly better than doing nothing, but this kind of repression requires a strong response or it will become business as usual. Mark off Wednesday September 10th at 3:30 PM as the time to restore Public Assembly in Parking Lot #4. Contact fri ends, media, musicians, photographers, and activists. Bring a picnic lunch or buy one locally from your friendly Farmers Marketeer next door. HUFF also plans to petition and protest in front of Coonerty's Bookshop Santa Cruz Sunday the 7th around 3:30 PM. Coonerty is the Mayor and the author of the Parking Lot Panic law (as I call his ban on public assemblies there). He should be greeted with ridicule and protest wherever he goes in his official capacity. He still refuses to release a public schedule of his slated public appearances and the his datebook of meetings he's had with lobbyists. He is running for a second term and should not only be defeated but rejected as an object lesson in rejecting his repressive "empower the police" and "cut back public comment and public space" vision of Santa Cruz. Coonerty will also be at City Council when it returns from summer recess meets Tuesday, September 9th. Folks can speak (for a shortened 2 minutes at Oral Communications--held at 3 PM and 7 PM. The next City Council candidate forum is 7-11 PM Wednesday September 10th held by the People's Democratic Club, the Santa Cruz Action Network, the Gay, Lesbian, Bisexual, Transgender Alliance at the Vets Hall at 846 Front St. Demand the candidates repeal Coonerty's outrageous laws, and turn back other anti-homeless laws like the Sleeping Ban and the Downtown Ordinances. City Council also needs to pass a long-delayed resolution, approved by the Citizens Police Review Board before it was strangled, opposing selective enforcement by the SCPD. Contact Don Zimmerman of the ACLU to suggest they send down lawyers, cameras, and advocates, since they originally opposed this law: donzim [at] aol.com . Contact the Santa Cruz City Council to demand they conduct a full review of the ordinance as promised by those who passed it. This review should include full police stats showing the alleged “crime wave” that prompted the law with indications on how crime has dropped in those lots with comparative figures from elsewhere in the City. SCPD propagandist Zach Friend should be instructed: citycouncil [at] ci.santa-cruz.ca.us . Contact Mayor Ryan Coonerty to demand his special interest “public assembly ban” law be repealed and additional public space opened: rcoonerty [at] ci.santa-cruz.ca.us . 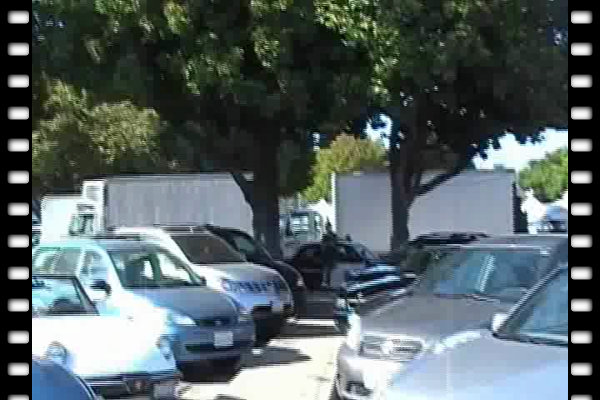 Here is a video showing the empty parking lot last Wednesday besides a few officers. Includes shots of last years protests , drummers circles, the arrest of Marry and more. People gather here to eat, to feed others, to communicate and share a feeling of community. It has gone on for years without trouble with exception to when the police show up and harass musicians and others who gather there under the guise of the 15 minute Parking Lot Panic Law. We stopped it last year. We can do it again. Last year an unknown amount of money was spent on police time spent doing surveillance, harassment and watching people play music and feeding the poor. I would hope the police can find better things to do in our community. Yes drums can be a bit loud. But if we can do video interviews during a loud protest and hear the person, it certainly is not breaking any sound laws. It is one day a week. If you leave people with no place to legally gather, they will not simply leave. They will eventually rebel out of necessity. Support the Farmers Market. Be prepared, be kind, know your rights and take a stand. §Guess not, it won't upload my flyer. My flyer was in the wrong format this should work. Thanks! Here is another flyer for distribution.